I waited all day for this book to arrive, and the moment it did, I sat down, braced myself for the beautiful art I expect from this author, read for hours until I was done, and was absolutely blown away. Rupi Kaur’s poetry will shake you and break you, force you to think, to look in the mirror and reflect, then build you back up again, stronger, better, and wiser. Never before have I read words put together so skillfully and emotionally. I fell in love with Milk and Honey, and with the way this woman uses words. Every single thing she said resonated with me on a spiritual level, wether or not I had experienced those emotions myself. I did not think she could equal Milk and Honey, but The Sun and Her Flowers has blown me away, and more than lived up to my expectations. 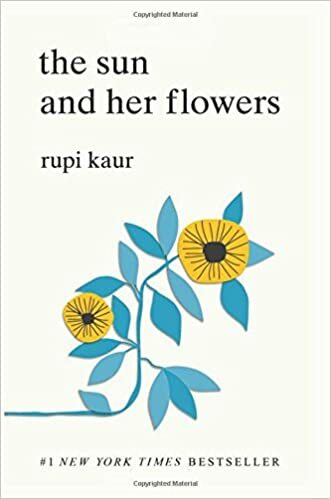 Man or woman, young or old, anything in between, Rupi Kaur’s poetry will teach you lessons you didn’t know you needed, give you feelings you didn’t know existed, evoke thoughts you never would’ve thought before, and resonate with you in some way, shape, or form. I highly recommended Milk and Honey, along with The Sun and Her Flowers for any poetry lover, and generally any human being. I am now positive that Rupi Kaur is my favorite poet, and I await the next book excitedly. Rupi is an inspiration and a poetry queen! The Sun and Her Flowers is far different from Milk and Honey. She includes longer pieces,which is refreshing. She includes a lot about self-love and the abuse she has faced in the past. I had a hard time putting it down! It’s a must read for those on the road to self healing.